Welcome to BuyVia - your first choice for UK coupons and product discounts that save you up to 50%! BuyVia was set up with one simple aim - to save our customers money and bring them superb shopping discounts of up to 50%. We are a small tech start-up with a real passion for e-commerce and the power of digital tech to hunt down the best possible retail deals! If you want to access the latest and best retail offers, it's time to discover our new and high-tech money-saving service for savvy shoppers! We offer the best product discount codes and coupons on the biggest database of fresh and exciting products and services. Even better, it takes just a few minutes to join and get started! Simply create your own personalised account in just a few quick clicks. Either choose the free account option or opt for the added-value account at just £9.99 for even bigger deals. You'll instantly gain exclusive access to the latest coupon and discount offers available, personalised for your needs and preferences. Love to shop online at leisure? Our website is a great option for snapping up the best offers before you buy. Keen to track down the best deals on the go? No problem, we also have a handy app available in Android, Apple and Kindle. 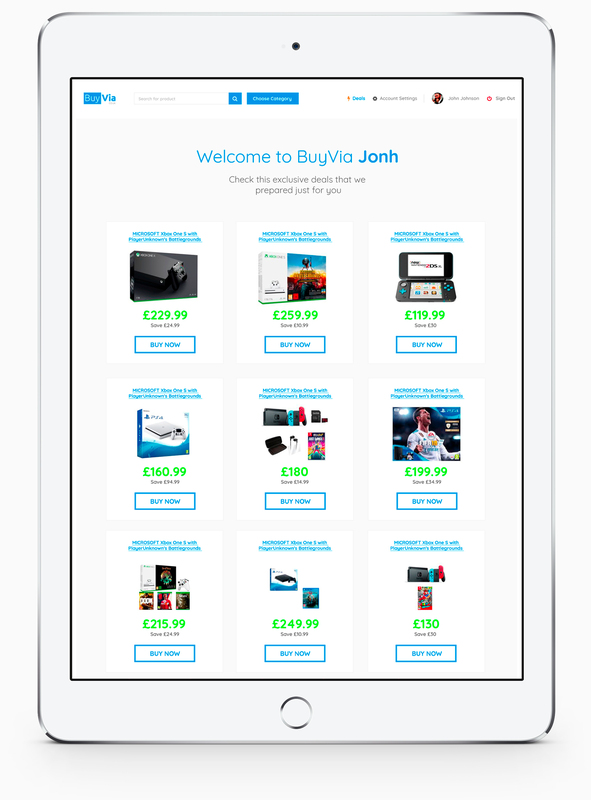 With BuyVia you can even create your own wish list to customise the discount deals that you want to receive. When you're out and about on your shopping travels, we will automatically send you a discount and alert when you pass a store selling one of your wish list items. Our high-tech software does all the money-saving for you! Use the BuyVia app to get push notifications with the latest tailored discount and coupon offers direct to your phone, allowing you to save up to 50% on the things you really want. We can also email you your offers so that you don't miss out - just customise your settings to suit your needs! For the latest and best possible deals on the products that you really want, simply register today. In a few clicks, you will instantly be able to access fantastic savings - and a great new community of fellow like-minded retail discount lovers through added features such as our personal member panel! Got any questions? Head to our FAQ for all the details or contact our friendly team.